If you are looking for a promotional marketing item that is both economical and beneficial, then Pocket Notebook with Pen from WA PRINTING is a perfect solution for you. 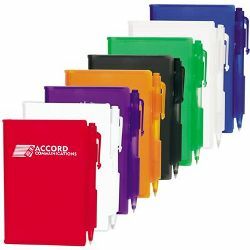 The notebook is available in a variety of colors-white, yellow, red, green, clear and orange. The more special thing is the black ink push button pen that comes with a loop holder on the closure side of the notebook. Your books will also look more memorable if imprinted logos and patterns for brand advertisement. It is now the time for you to pick up the phone and give us a phone call for notebook orders. We guarantee to provide products at the most reasonable prices but highest quality.